The Users Insights WordPress plugin includes out of the box support for the popular BuddyPress WordPress plugin. It includes all of the main BuddyPress user activity info, such as groups, friends and activity updates info, all well structured in the Users Insights users table. Users Insights also automatically detects all of the BuddyPress custom user profile (Xprofile) fields and adds them to the user table. 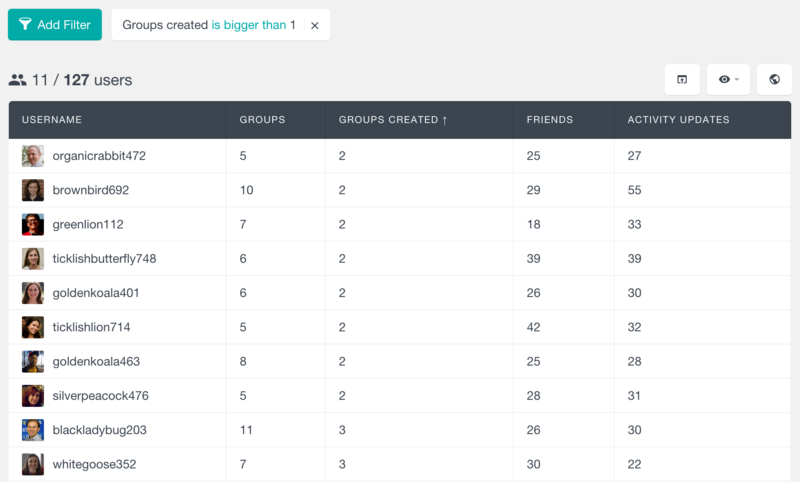 All of the BuddyPress data is also available in the Users Insights filters so that you can easily filter your users/members by different BuddyPress criteria. The BuddyPress module for the Users Insights plugin can be a very powerful analytics tool to help you better understand how the members interact on your BuddyPress site. These filters can be very useful to filter your BuddyPress members by the number of interests that they have or they can also be an indicator of how active your members are. 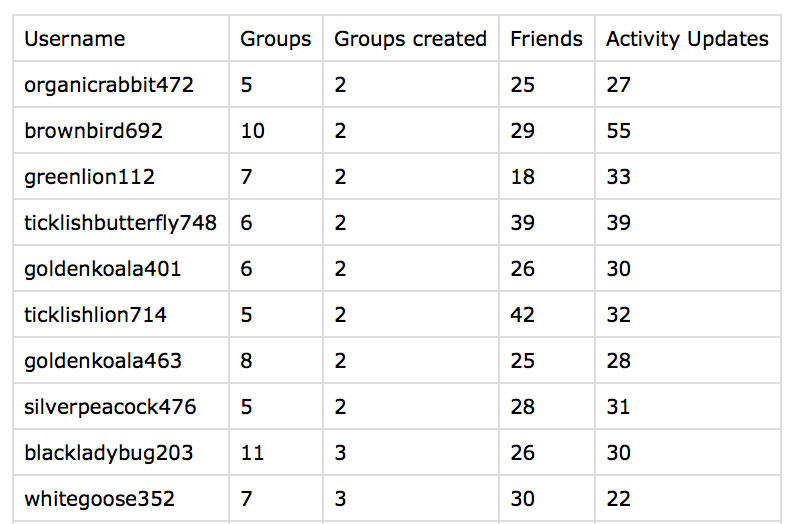 The Users Insights user profile page also loads the full list of the groups that the BuddyPress member has created, including a link to each group. The BuddyPerss module of the Users Insights plugin also loads general activity updates information – the activity updates includes all of the main BuddyPress member activity, such as comments posted on the group pages or messages posted to other members. 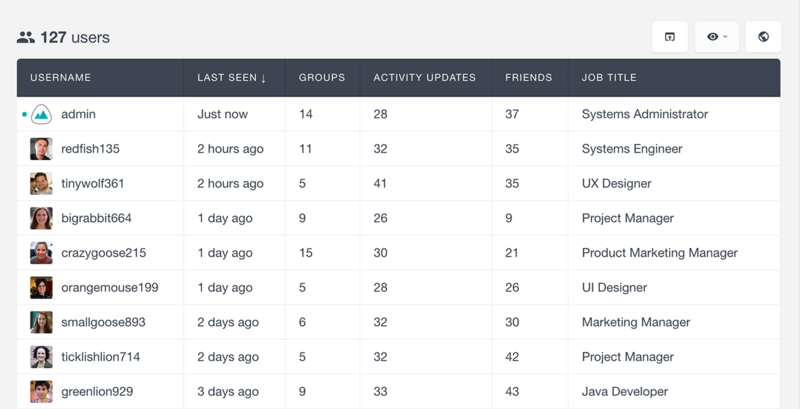 The number of activity updates is added as a separate column to the Users Insights users table – it can be very useful to understand how active your BuddyPress members are. 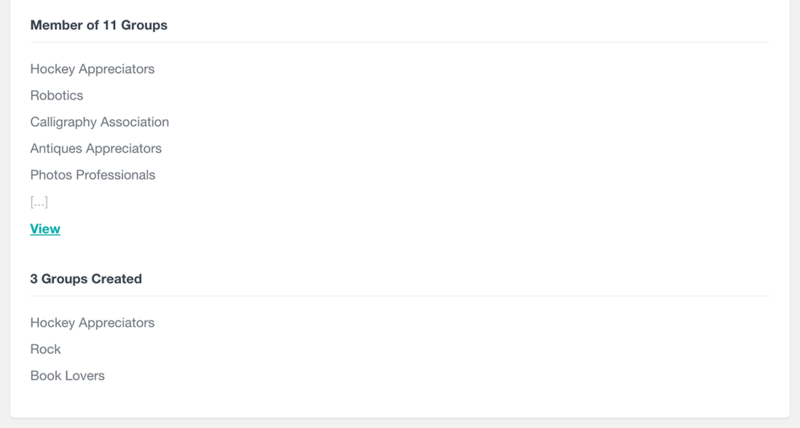 The Activity Updates info is also available for filtering in the Users Insights users filter, so you can easily filter your BuddyPress members by number of their activity updates. This can be very useful to see who your most or least active members are. The BuddyPress module of Users Insights automatically detects all of the registered BuddyPress user profile fields (Xprofile fields). Each field can be optionally displayed as a column in the Users Insights user table making it easy to review the fields data for each user. 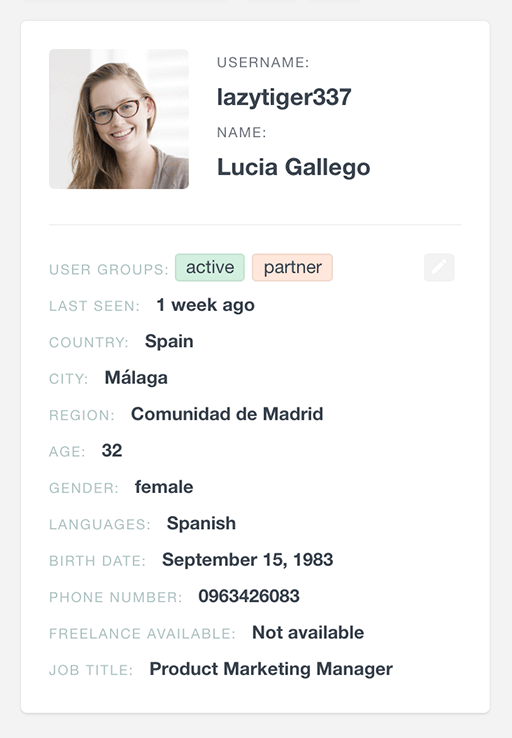 Additionally, all the profile fields are also available in the Users Insights filters, so you can search and filter your BuddyPress member list based on the fields data. Users Insights intuitively recognizes the types of the fields and provides the corresponding filter operators, based on the field type. 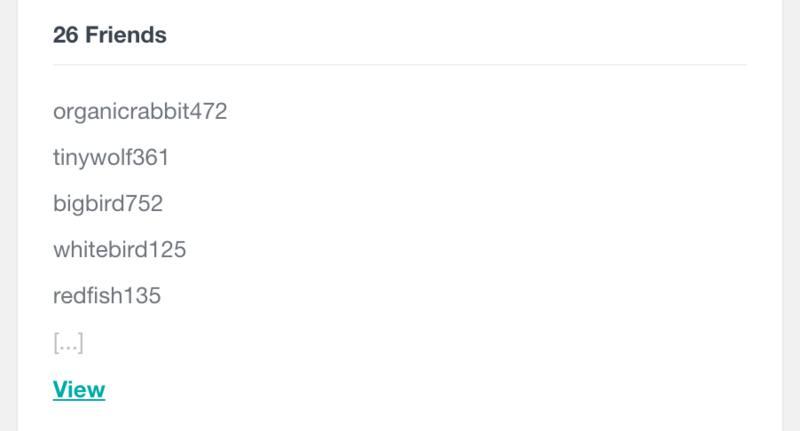 The BuddyPress number field is automatically recognized as a numeric field in the users table. In this way Users Insights provides the corresponding options to sort the table by the numeric values, as well as filter the user list with available numeric operators, such as “is bigger/smaller” or “equals”. 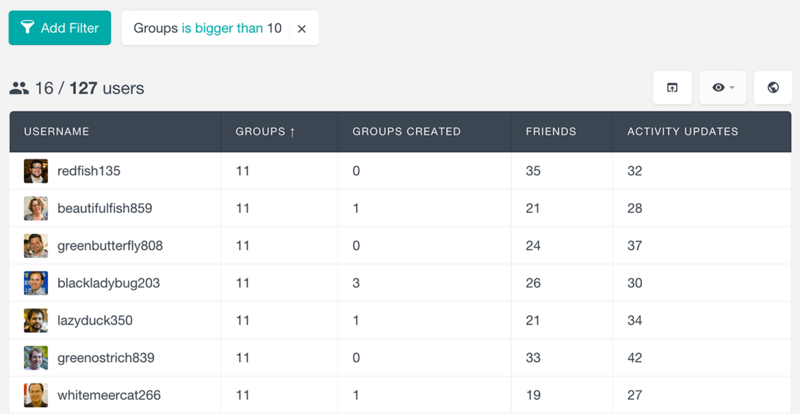 The BuddyPress Multi Select and Radio fields are recognized as option fields in Users Insights. This means that the filters would automatically list the available options when you try to filter the users by the option field data. The available filter operators are “is” and “is not”, so you can find the users that have or haven’t selected a particular option. 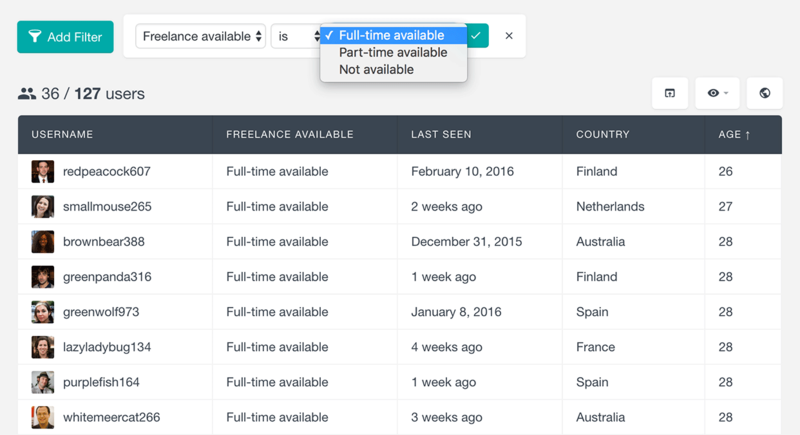 The Users Insights plugin automatically recognizes the BuddyPress Date Selector field type as a date field. When a column in the user table is detected as a date column, you can sort the user list based on this column’s values in a chronological order. Additionally, the Users Insights filters will provide the corresponding date operators, such as “is before/after” or is “more/less than x days ago”. The BuddyPress Multi Select Box and Checkboxes fields are detected as multi-option fields in the WordPress user table. Users Insights automatically displays the saved values in a comma-separated format. The filters detect those fields as text fields, so you can use the “contains” and “does not contain” filters to search for users that have or haven’t selected an option. The rest of the fields, such as the Text Box and the URL fields, are detected as text fields. The default text operators, such as “contains/does not contain” and “is/is not” are available in the filters sections. 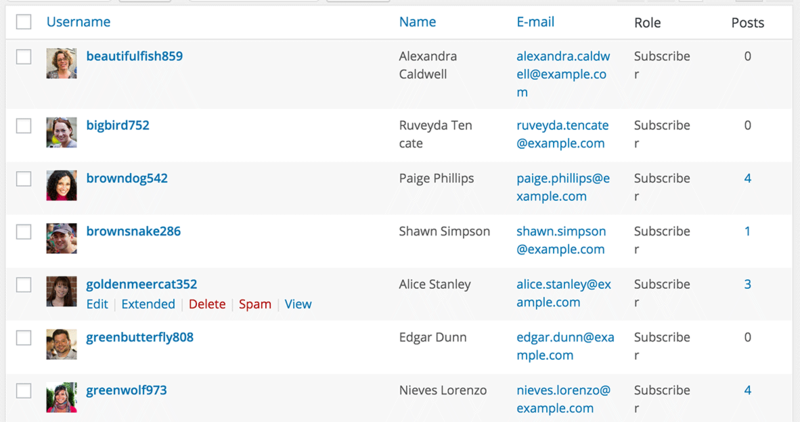 All of the above-mentioned BuddyPress data that the Users Insights plugin generates, such as groups, friends and activity info is also available for export in a CSV format with the default Users Insights export functionality. You can easily select which columns to be exported and apply custom filters so that you can select a specific set of users that can be exported. Additionally, your can set the order of the users data that will be exported by changing the default Order options of the Users Insights users table. The BuddyPress reports feature of Users Insights is another tool that can help you analyze your BuddyPress user data and activity. 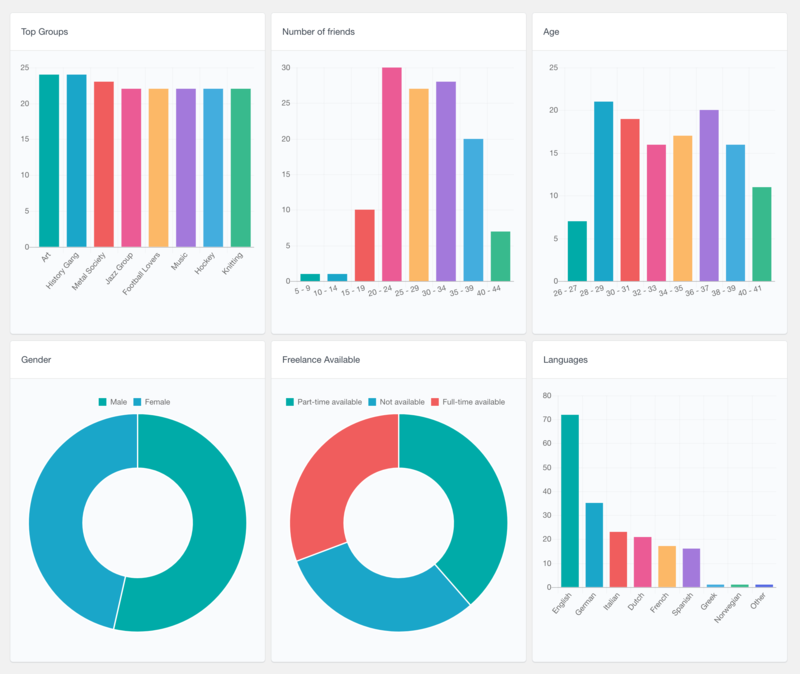 The reports include general community reports, as well as charts visualizing the user profile data. The user profile data is automatically detected and available as various interactive charts. To learn more about all the available reports, you can visit the BuddyPress Reports page.